Will the Dow Jones Industrial Average come roaring back to life in 2016, or will the year prove to be another bad one for the markets? Three Motley Fool contributors weigh in. Without a working crystal ball, it's impossible to know what the markets will do in any given calendar year -- but it's still fun to speculate, and investors can learn a thing or two in the process. We asked three of our Motley Fool contributors to predict where they think the Dow Jones Industrial Average (DJINDICES:^DJI) will finish in 2016. Read below to see if you agree with what they had to say. It's coming down to the wire, but 2015 might well be the first year in quite some time that the Dow Jones Industrials will fail to gain ground from the end of the previous year. Some investors believe that once the bull-market streak fails, the average will post larger losses. Yet the stock market doesn't always make big moves in one direction or another. At various times, the Dow has paused for a year or longer, only to continue moving upward in subsequent years at a measured pace. That's the general basis for my call for the Dow to finish 2016 at the 20,000 level. That would represent a gain of about 14% from current levels, which would be a strong yet reasonable return after a year of stagnation. Although some are worried about macroeconomic factors like rising interest rates, alternatives to stocks still offer rock-bottom yields and are likely to continue to do so for at least the next year. In that light, stocks have room to climb further before the bull market gives up the ghost, and returning to the all-time highs the Dow set in May wouldn't require a huge percentage advance. 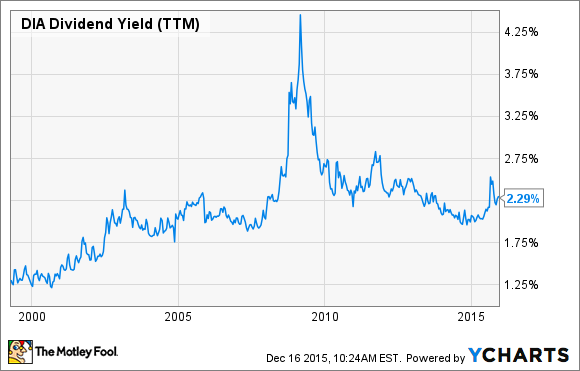 Add in a dividend yield of around 2%, and the Dow could make a nice investment for 2016. If you asked me to rub my rabbit's foot, pick up my four-leaf clover, and rub my crystal ball, I'd say that the Dow Jones Industrial Average will finish 2016 down by somewhere in the mid- to high-single-digit percentage range. Let's call it a finish of about 16,000. Why such pessimism? I believe there are some telltale signs on the horizon that a recession could be nearing, aside from the fact that recessions are a common part of the economic cycle. For one, falling commodity prices are, to me, a bit of a giveaway. Sometimes falling commodity prices can be good news, because it can mean that consumers' wallets are less strained. But after an extended drop in oil, natural gas, copper, and other important commodities, we could also infer that there's an overabundance of supply, and demand is falling. China is a major consumer of copper and other commodities that we can use to gauge the health of the global economy, and its growth rate has been slowing. Weakened commodity prices also threaten energy-sector jobs. Another concern is that we've witnessed large U.S. companies failing to hit Wall Street's sales-growth expectations. Based on FactSet's research into third-quarter earnings reports for the S&P 500 -- which includes all of the Dow's 30 components -- just 45% topped the Street's sales projections. Furthermore, three times as many companies have issued downside guidance to upside guidance. In all fairness, a majority of large U.S. companies are still topping EPS estimates, but that's most likely due to lowered guidance, aggressive cost-cutting, and share buybacks. Remember that although I believe the Dow may be headed for a rough year, that doesn't mean you need to change your investing strategy one bit. Guesses are exactly that -- guesses -- and I've been wrong as many times as I've been right. If you stick to buying solid businesses and invest with regularity, then you should be able to weather whatever the market throws your way in 2016. Like Sean, I see a lot of reasons to believe that a global recession could be looming, which leads me to conclude that markets around the world might be in for a rough 2016. However, when considering that the Dow Jones Industrial Average is currently trading at a reasonable price-to-earnings ratio of 17, and it currently offers up a dividend yield of 2.29%, I don't think it will be hurt all that badly -- if at all. When combining the downbeat global economy with the Dow Jones Industrial Average's reasonable price tag, I believe the index will trade more or less sideways during 2016. That leads me to predict that the index will finish 2016 at 17,616, which is exactly where it's trading now. I can almost guarantee that the three forecasts in this article will be proven wrong in time, as the price of the Dow Jones Industrial Averages is always highly dependent on what kind of mood investors find themselves in at any given time. It's impossible to know how investors will be feeling at the end of 2016; therefore you should continue to focus on buying great companies at fair prices, and ignore any short-term price movements that the market may throw your way.